The temple was founded by Luang Pu Supha, claimed to be the world’s oldest man. Imagine a bright, sunny morning and I’m driving through Phuket Town with my wife. The kids have been dropped off at school, and we’ve put in a broken laptop for repairs. We’re driving on familiar roads, heading north near the Vachira hospital. There is a little-used side road by the hospital that heads up to the top of Rang Hill. My wife asks – do you know the temple up this road? Indeed I do not. 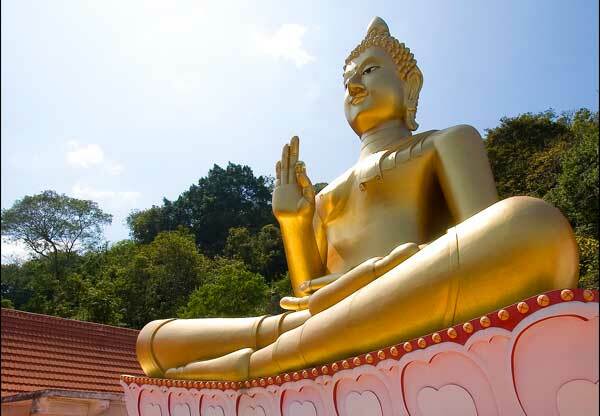 small side road by the hospital is something quite impressive – there’s more than one Big Buddha in Phuket. We arrived at the temple late morning, but I did not have my camera with me (we hadn’t planned to stop anywhere that day), so instead we had a quick look, bumped into a local photographer I know, then dashed home, picked up the kids, and told them we were going to a temple. Hooray, they said! Well, perhaps not quite, but at least this temple was one they’d never seen before. Rang Hill Temple was founded by a monk called Luang Pu Supha, who some claim to be the world’s oldest man (a fact not ratified by Guinness World Records). His image can be found on amulets for sale at the temple, though the supposed 115-year-old now lives at the temple named after him, Wat Luang Pu Supha, also located in Phuket. Unfortunately I didn’t enter as the rest of the family had seen enough and were already waiting in the car. In any case I will return sometime soon.